It happened on the white sand of Copacabana beach three years ago. As the waves rolled toward the shore of Rio de Janeiro in Brazil, Sahm joined the 3 million young people from around the world who had come there, all of them kneeling together in silence on the sand during a time of eucharistic adoration. In that moment, all the major struggles, all the setbacks, all the rain that marked the earlier days of World Youth Day Rio faded away. As another World Youth Day approaches—this time in Krakow, Poland, on July 25-31—youths and young adults from across the archdiocese are preparing for a pilgrimage that they hope will provide a similar experience of transformation and deepening faith. Gail and Alex Ocana have made World Youth Day in Krakow such a priority that, before their wedding last September, they set up an account so that wedding guests could contribute to their pilgrimage fund as a wedding gift. The couple—members of St. Joan of Arc Parish in Indianapolis—are among the 64 young adults from the archdiocese who will be making an 11-day pilgrimage to World Youth Day in Poland. Twenty-eight college-age students are among the young adult group. Their itinerary includes visits to Prague and Wadowice, the hometown of St. John Paul II, before heading to Krakow for World Youth Day activities that include prayer, the Stations of the Cross and a closing Mass celebrated by Pope Francis on July 31. 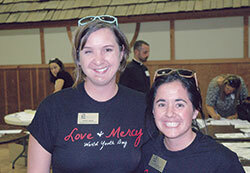 The archdiocese’s Youth Ministry Office will lead 104 youths to World Youth Day. Their 12-day itinerary includes four days in Rome—with a Mass at St. Peter’s Basilica and visits to the Vatican Museum and the Sistine Chapel—before traveling to Krakow. “I hope that the pilgrims have the opportunity to experience the larger Church, and experience a reaffirmed hope in the upcoming generation of Catholics,” says Scott Williams, coordinator of youth ministry for the archdiocese. Williams had his own memorable experience from what has been described as “the beautiful chaos” of World Youth Day in Rio de Janeiro in 2013. “Pilgrims from all over the world converged in the streets to celebrate together the opening Mass,” he recalls. “In high school and college, I took a lot of Spanish classes, and I thought that I would get by just fine. I learned the hard way that Portuguese (the main language in Brazil) and Spanish aren’t as similar as they sound. That’s the kind of experience 25-year-old Krissy Vargo is hoping for as she makes her first World Youth Day pilgrimage. With the memory of a white, sandy beach and “a glimpse of heaven’ still fresh in her mind three years later, Sahm hopes the personal transformations from World Youth Day also contribute to a transformation for the archdiocese. “The pilgrimage is meant to transform you, so you’re a different person at the end,” she says. “We get stuck in our own lives, our worlds and our parishes. It’s good to see what the ‘universal Church’ means.